Job searching can be a long and exhausting process. Between applying for new jobs, updating your resume, and preparing for interviews, looking for work can feel like a full-time job. In a challenging economy, competition for roles is tough, and it can be difficult to stand out from the crowd. Luckily, there is one easy way to set yourself apart and make an excellent impression: writing thank-you notes. Why Write a Thank-You Note? Remind the hiring manager of your skillset and highlights from your interview, as well as emphasize your enthusiasm for the role. Demonstrate your soft skills, including communication and writing skills. Beyond showing off your specific skills, sending a thank-you letter makes you seem more professional. It shows the hiring manager that you understand how to be polite in a professional setting. Give you a second chance to highlight an important detail. Did you forget to mention a crucial skill, important work experience, or essential qualifications? Your thank-you note gives you another chance to make a good impression. Fix a mistake. Think you’ve blown the job interview? A well-written note might redeem you and give you another shot at the job. Explain what went wrong, highlight your references, and ask for another chance. Differentiate you from the competition. If it comes down to two candidates who are equal, a thank-you letter may very well be the deciding factor. Remember that job interviews are only partly about skills and abilities. Once the field has narrowed to qualified applicants, hiring managers start looking for folks who’ll fit in with the team. Show that you’re the most considerate candidate, and they may well decide that you’re the one they’d like to work with every day. What Do I Include in a Thank-You Note? A post-interview thank-you note does not have to be very lengthy. Just a few sentences is sufficient to convey your interest in the position, remind them of your talents, and thank them. You want to be gracious and appreciative of the interviewer's time and show that you want to work alongside them as part of a team. Think of your note as a sales pitch and reiterate why you want the job, how you’re qualified for the role, and why you’re a better choice than the competition. What Should a Thank-You Letter Look Like? Thank-you letters can be sent in many forms; some people like traditional note cards, but if the hiring process is going quickly, you may want to send an electronic version to make sure it gets there in time. Email is increasingly acceptable, but a handwritten note, if time allows, is recommended. Regular mail is less common and will make a more lasting impression. But if you have poor handwriting, a typed letter is perfectly fine, too. Microsoft makes it easy by offering attractive templates. Microsoft interview letter templates are available as a free download for Microsoft Word users, or available within your Word program, to use to create an interview thank-you or follow-up letter. Type keywords, e.g., “thank you letter,” into the search box. Visit the Letters section in Microsoft Templates, browse the letter templates, then click on the letter title to preview the sample. Click the Download Now button, then follow the instructions to download the letter template to your computer. Don’t see what you’re looking for? Try other free Microsoft templates, including cover letters, resignation letters, reference letters, thank-you letters, interview letters, and a variety of business letters. Always customize your thank-you note. 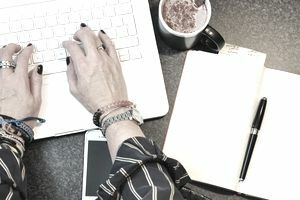 While templates can be a solid jumping-off point for your message, it’s essential to personalize your note with details from your interview experience and skillset. The last thing you want is for the hiring manager to notice that your letter bears a strong resemblance to an online template. Proofread your note before sending. A careless mistake could cost you the interviewer’s confidence, and therefore the job. Test your email message if you send your note electronically. Send yourself a test message to make sure that there are no formatting mistakes before you pass your message along to the hiring manager. Send your message within 24 hours, if possible.